I've had this book in my "to read" stack for some time now. Honestly, the subtitle put me off. It smacks of a self-helpish kind of advice that might help a few people get clear on a few things that knew they should already be doing anyway. Now that I have taken the time to read it, I am pleased to report that I was pleasantly surprised by what was between the covers (and I might add that, in my opinion, the graphic design on the covers is fantastic). For starters, this is not a self-help book. It's a serious plea for all of us to become people who practice humility. What separates this book from a book like Humility by C.J. Mahaney, is that Mahaney is a pastor, while Dickson is a professor. In fact, Dickson is the Senior Research Fellow of the Department of Ancient History at Macquarie University in Sydney Australia. This book travels down Dickson's specialty - the ancient roads of history - in order to show how humility evolved from a vice to virtue. But he doesn't leave it in the past. He brings it forward into the present with some helpful tips on how we can become people who are more humble than we are today. 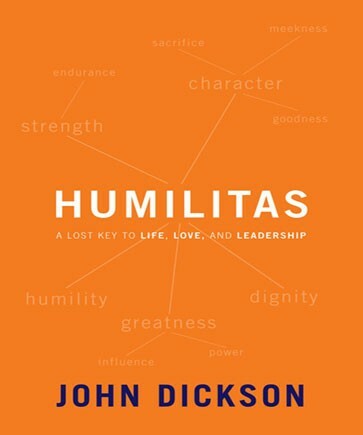 In Humilitas (the Latin word for humility), Dickson's thesis is straightforward: "The most influential and inspiring people are often marked by humility" (p. 19). How does he define humility? He says, "Humility is the noble choice to forgo your status, deploy your resources or use your influence for the good of others before yourself" (p. 24). The language of influence and inspiration calls to mind the topic of leadership, and that's exactly where he makes his first move. And, frankly, it's a good move. He spends 16 pages on the topic of leadership and humility's role in it (pages 31-47). Even though he's outside of his specialty, those 16 pages are excellent. His analysis of leadership "tools" - ability (p. 37), authority (p. 38), persuasion (p. 39), and example (p. 40) - are dead-on. He ties the section together by saying, "I consider persuasion and example (in combination) to be the heart of leadership" (p. 43). On leadership, his ideas are indebted to Jim Collins from Stanford, John Kotter from Harvard, and Simon Walker from Oxford. It's hard to go wrong when you're relying on guys like that. The value for the reader is that Dickson has brought together the best of what those guys have to offer in a compact, digestible presentation. The middle chapters trace the growth and qualities of humility, with the most important observation being that, "For [the early Christians] the crucifixion was not evidence of Jesus' humiliation (humilitas) but proof that greatness can express itself in humility (humility), the noble choice to lower yourself for the sake of others" (107). My favorite chapter was titled "Harmony: Why Humility Is Better Than Tolerance." After lamenting about the race to the bottom, where all convictions are set aside and relativism (all views are equally valid) reigns supreme, Dickson concludes, "We maintain our convictions but choose never to allow them to become justification for thinking ourselves better than those with contrary convictions" (p. 170). That's a much better approach than a vague, wishy-washy version of tolerance. 6) Forget about it (p. 182). Overall I thought this was an excellent book. It's well-written, extremely educational, and very convincing. In tracing the history of humility, Dickson ably convinces readers that humilitas is better than hubris. Disclaimer: I was provided a review copy of this book from the Amazon Vine Program.